^ "Pharmacology Guide: In vitro pharmacology: concentration-response curves." GlaxoWellcome. ^ Hopkins AL, Groom CR; Groom. The druggable genome. Nature reviews. Drug discovery. 2002, 1 (9): 727–30. PMID 12209152. doi:10.1038/nrd892. ^ May LT, Avlani VA, Sexton PM, Christopoulos A; Avlani; Sexton; Christopoulos. Allosteric modulation of G protein-coupled receptors. Curr. Pharm. Des. 2004, 10 (17): 2003–13. PMID 15279541. doi:10.2174/1381612043384303. ^ 6.0 6.1 Christopoulos A. Allosteric binding sites on cell-surface receptors: novel targets for drug discovery. Nature reviews. Drug discovery. 2002, 1 (3): 198–210. PMID 12120504. doi:10.1038/nrd746. ^ Bleicher KH, Green LG, Martin RE, Rogers-Evans M; Green; Martin; Rogers-Evans. Ligand identification for G-protein-coupled receptors: a lead generation perspective. Curr Opin Chem Biol. 2004, 8 (3): 287–96. PMID 15183327. doi:10.1016/j.cbpa.2004.04.008. ^ Rees S, Morrow D, Kenakin T; Morrow; Kenakin. GPCR drug discovery through the exploitation of allosteric drug binding sites. Recept. Channels. 2002, 8 (5–6): 261–8. PMID 12690954. doi:10.1080/10606820214640. ^ Negus SS. Some implications of receptor theory for in vivo assessment of agonists, antagonists and inverse agonists. Biochem. Pharmacol. 2006, 71 (12): 1663–70. PMC 1866283. PMID 16460689. doi:10.1016/j.bcp.2005.12.038. ^ Ariëns EJ. Affinity and intrinsic activity in the theory of competitive inhibition. I. Problems and theory. Archives internationales de pharmacodynamie et de thérapie. 1954, 99 (1): 32–49. PMID 13229418. ^ 11.0 11.1 Stephenson RP. A modification of receptor theory. 1956. Br. J. Pharmacol. 1997, 120 (4 Suppl): 106–20; discussion 103–5. PMC 3224279. PMID 9142399. doi:10.1111/j.1476-5381.1997.tb06784.x. of the original article. ^ Vauquelin G, Van Liefde I; Van Liefde. G protein-coupled receptors: a count of 1001 conformations. Fundamental & clinical pharmacology. 2005, 19 (1): 45–56. PMID 15660959. doi:10.1111/j.1472-8206.2005.00319.x. ^ 14.0 14.1 14.2 Lees P, Cunningham FM, Elliott J; Cunningham; Elliott. Principles of pharmacodynamics and their applications in veterinary pharmacology. J. Vet. Pharmacol. Ther. 2004, 27 (6): 397–414. PMID 15601436. doi:10.1111/j.1365-2885.2004.00620.x. ^ Patrick, Graham L. An Introduction to Medical Chemistry. 2009-03: 62. ISBN 9780199234479. ^ 16.0 16.1 16.2 Swinney DC. Biochemical mechanisms of drug action: what does it take for success?. Nature reviews. Drug discovery. 2004, 3 (9): 801–8. PMID 15340390. doi:10.1038/nrd1500. ^ Wyllie DJ, Chen PE; Chen. Taking the time to study competitive antagonism. Br. J. Pharmacol. 2007, 150 (5): 541–51. PMC 2189774. PMID 17245371. doi:10.1038/sj.bjp.0706997. ^ Colquhoun D. Why the Schild method is better than Schild realised. Trends Pharmacol Sci. 2007, 28 (12): 608–14. PMID 18023486. doi:10.1016/j.tips.2007.09.011. ^ Schild HO. An ambiguity in receptor theory. Br. J. Pharmacol. 1975, 53 (2): 311. PMC 1666289. PMID 1148491. doi:10.1111/j.1476-5381.1975.tb07365.x. ^ Cheng Y, Prusoff WH; Prusoff. 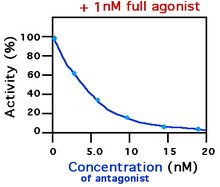 Relationship between the inhibition constant (K1) and the concentration of inhibitor, which causes 50 per cent inhibition (I50) of an enzymatic reaction. Biochem. Pharmacol. 1973, 22 (23): 3099–108. PMID 4202581. doi:10.1016/0006-2952(73)90196-2. ^ 21.0 21.1 21.2 Vauquelin G, Van Liefde I, Birzbier BB, Vanderheyden PM; Van Liefde; Birzbier; Vanderheyden. New insights in insurmountable antagonism. Fundamental & clinical pharmacology. 2002, 16 (4): 263–72. PMID 12570014. doi:10.1046/j.1472-8206.2002.00095.x. ^ Arend WP. Interleukin-1 receptor antagonist. Adv. Immunol. Advances in Immunology. 1993, 54: 167–227. ISBN 9780120224548. PMID 8379462. doi:10.1016/S0065-2776(08)60535-0. ^ eds, David E. Golan, ed.-in-chief ; Armen H. Tashjian, Jr., deputy ed. ; Ehrin J. Armstrong, April W. Armstrong, associate. Principles of pharmacology : the pathophysiologic basis of drug therapy 2nd. Philadelphia, Pa., [etc. ]: Lippincott Williams & Wilkins. 2008: 25 [2012-02-05]. ISBN 978-0-7817-8355-2. ^ Surin A, Pshenichkin S, Grajkowska E, Surina E, Wroblewski JT; Pshenichkin; Grajkowska; Surina; Wroblewski. Cyclothiazide selectively inhibits mGluR1 receptors interacting with a common allosteric site for non-competitive antagonists. Neuropharmacology. 2007, 52 (3): 744–54. PMC 1876747. PMID 17095021. doi:10.1016/j.neuropharm.2006.09.018. ^ Patil PN. Everhardus J. Ariëns (1918–2002): a tribute. Trends Pharmacol. Sci. 2002, 23 (7): 344–5. doi:10.1016/S0165-6147(02)02068-0. ^ Bosier B, Hermans E; Hermans. Versatility of GPCR recognition by drugs: from biological implications to therapeutic relevance. Trends Pharmacol. Sci. 2007, 28 (8): 438–46. PMID 17629964. doi:10.1016/j.tips.2007.06.001. ^ Pulvirenti L, Koob GF; Koob. Being partial to psychostimulant addiction therapy. Trends Pharmacol. Sci. 2002, 23 (4): 151–3. PMID 11931978. doi:10.1016/S0165-6147(00)01991-X. ^ Vadivelu N, Hines RL; Hines. Buprenorphine: a unique opioid with broad clinical applications. J Opioid Manag. 2007, 3 (1): 49–58. PMID 17367094. ^ Greasley PJ, Clapham JC; Clapham. Inverse agonism or neutral antagonism at G-protein coupled receptors: a medicinal chemistry challenge worth pursuing?. Eur. J. Pharmacol. 2006, 553 (1–3): 1–9. PMID 17081515. doi:10.1016/j.ejphar.2006.09.032. ^ Kenakin T. Efficacy as a vector: the relative prevalence and paucity of inverse agonism. Mol. Pharmacol. 2004, 65 (1): 2–11. PMID 14722230. doi:10.1124/mol.65.1.2. ^ Leurs R, Church MK, Taglialatela M; Church; Taglialatela. H1-antihistamines: inverse agonism, anti-inflammatory actions and cardiac effects. Clin Exp Allergy. 2002, 32 (4): 489–98. PMID 11972592. doi:10.1046/j.0954-7894.2002.01314.x. ^ Frang H, Cockcroft V, Karskela T, Scheinin M, Marjamäki A; Cockcroft; Karskela; Scheinin; Marjamäki. Phenoxybenzamine binding reveals the helical orientation of the third transmembrane domain of adrenergic receptors. J. Biol. Chem. 2001, 276 (33): 31279–84. PMID 11395517. doi:10.1074/jbc.M104167200.